We represent SONOMA Instrument preamplifiers, which are quite common in emission measurements. Customers can select the best fit preamplifier from 9kHz - 5GHz range. COM-Power products offer wide frequency range of amplifirs from 10Hz to 40GHz. These are suitable for EMI measurement and small signal amplification purposes. Schwarzbeck preamplifiers are desined to be used for small size DC driven. The amplifiers can be connected directly to the antenna so the user can minimize the path losses of captured EMI signal from the antenna. Our original preamplifier is ultra wideband, middle gain so that a user does not have to exchange preamplifiers at different frequency band. 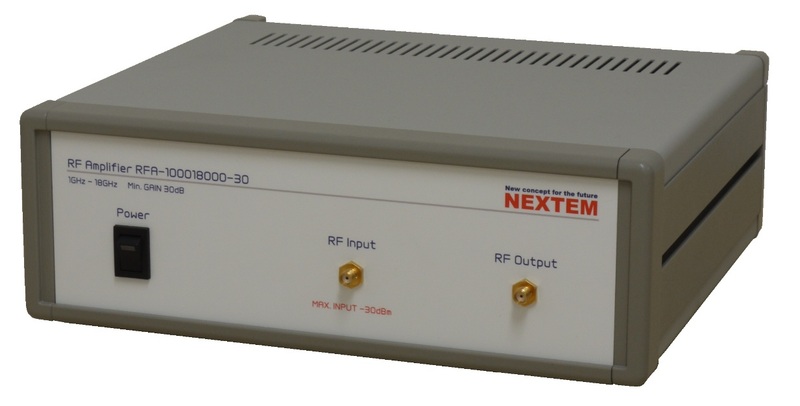 We supply "High Gain" and "Low Noise Figure" preamplifiers which are quite necessary for GHz band (1GHz - 40GHz) emission measurements. By combination with horn antennas, it largely improves measurements' S/N ratio. Caution!!) EMC-PA-*** Series are sometimes not suitable for spurious or harmonics measurements.